Congratulations to tour winner Ranjit G.
Goddess Fish Promotions is organizing a Virtual Book Tour for Annabelle and Aiden: Worlds Within Us by J.R. Becker, a Children's book (science focus) available now. The tour will run December 11 - December 15, and J.R. Becker is available for guest post and interviews. A PDF copy of the book is available for review in conjunction with a guest post or interview. J.R. Becker will be awarding 2 personally-signed Annabelle & Aiden books, along with 3 limited-edition Annabelle & Aiden bookmarks (US ONLY) to a randomly drawn winner via rafflecopter during the tour. "How did our universe form?" Annabelle wonders to Aiden. Luckily, the friendly Tardigrade Tom answers by taking the children on their biggest adventure yet! Soaring through space and time, they witness the universe's earliest stages, marvel at the big bang, and learn how each and every one of us is literally made of the same stardust. 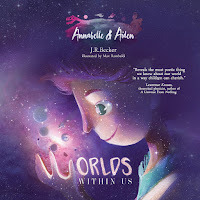 Readers will learn how we each hold a part of the universe inside us, and are far more special, interconnected, and 'larger' than we may think. I'd like to host with an interview on Dec 13 at Reviews and Interviews. thank you! This and That Book Blog can host on December 11th, any feature is fine. I can host @The Avid Reader on December 15 with an interview or guest post whichever you need.